There are a lot of theories on the origin of the name of our second Polish capital city. Some are purely theoretic and pragmatic but one that I like in particular is connected with the legend. In the time of Game of Thrones when I say that it includes the dragon, I should get your attention. Walking down the Grodzka street, which is one the oldest ones in the city as is the part of the Royal trade route back from at least 13th Century, you will end up facing the huge walls of the Wawel’s Castle. My suggestion is to turn right first and head towards the Wawel’s dragon. Ah yes.. so the legend. Once upon a time… to be more specific in the 1st century, there was a lair on the Wawel’s hill where the dragon that spread the havoc among the citizens as was responsible for attacks on local virgins. No one was brave enough to face him or the strongest and most courageous knights were dying at the Vistula’s bank. Until one day the brave cobbler Dratewka or later Prince Krakus came up with a very smart or… original idea to create a fake sheep filled in with brimstone. Yes, I was asking myself why with brimstone not with dynamite or … poison. Well.. the legend says that it made the dragon so thirsty that has started to drink water from the restless Vistula. He couldn’t stop, so… he burst out and liberated the city from his cruelty. 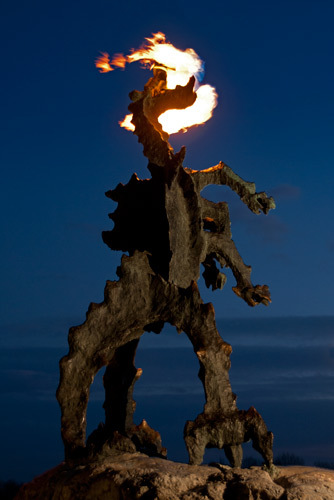 Until today the inscription on the sculpture is as below and the dragon’s cave can be visited during the summer. HERE IS THE CAVE IN WHICH HAVING KILLED THE WILD DRAGON HE SETTLED AT WAWEL, AND FOUNDED THE CITY OF KRAKÓW. It is interesting to mention that the bell located in the Sigmund’s Tower can be only heard during the most important occasions in Poland and in the world. Unfortunately, also during the reign of the same King the capital city of Poland was moved to Warsaw and Wawel started being neglected or occupied by Prussians leading to worsening it’s condition significantly. One of my favorite parts are actually the Tombs of Royal family or very important figures from Polish history placed under the castle. If you are interested in polish history, I am sure you will find it fascinated to walk through the tombs of people who used to have the unimaginable power over our ancestors. Of course there is a controversy of the more modern graves placed in that area after the plane crash in Smoleńsk few years back, but this should not disperse a tourist. How many pigeons have you seen on the Market Square in Kraków? Hah.. no one is able to count them. As we are very creative people by nature (I hope!) there is another legend linked to that and as locals are used to avoiding those little flying creatures and trying not to walk under them, the tourists can go back in time and think about the legend linked with them which says that pigeons are the knights that have been put under the spell when the Prince of Krakow of that time had no money and asked the fairy for help. She then turned all his army into birds and they have started taking out rocks from the walls of St. Mary’s Church making them fall on the ground and changing into golden coins. The prince was now rich but… with no army to defend the city. The fairy has promised to take the spell back, however, under the condition that he will go to Rome and see the Pope. Unfortunately, Prince forgot quickly about his city and spent all the money on wine and decadent life on the way to Italy and Kraków is.. filled with soldiers closed in the little pigeons’ bodies. Also here there is a legend of the Trumpeter that was motivating the soldiers to defend the city, however, has been killed with a single Tatar’s arrow, so the melody has finished. Until today the hejnał is being played only until the moment when it was stopped at the memorable battle. The beautiful altar on photos above created by Veit Stoss has also its story. First of all the creation took over 12 years and spending the unimaginable amount of money to finish it. Afterwards he came back to Germany and was imprisoned for… an investment fraud! The altar survived ages of different historic moments until the Nazi soldiers came and stole it. Fortunately, unlike the other pieces of art, it was found in the unaffected condition and brought back to the church. 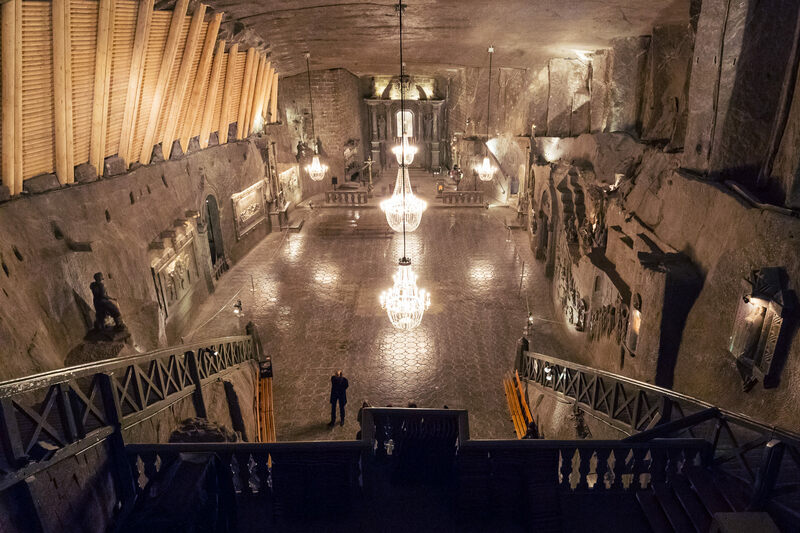 Have you heard of Wieliczka salt mine? No, well… high time to discover the place! 2.5km of a walk with a guide. Starting with going down the stairs to 63m under the ground and reaching 130m towards the end of the trip. The legend here says that hungarian Princess Kinga was about to marry our Polish King, so as the part of her dowry she has asked for the lump of salt from the salt mine in Hungary, as it was very pricey in Poland and not only. She went to the salt mine with her Father and threw her engagement ring into the shaft. Upon arrival to Poland she has asked minors to dig a whole in the ground until they reached a rock. To everyone’s disbelief they have discovered there salt! When they split it into halves they have discovered Kinga’s engagement ring. That’s why she has become also the patron of polish miners. 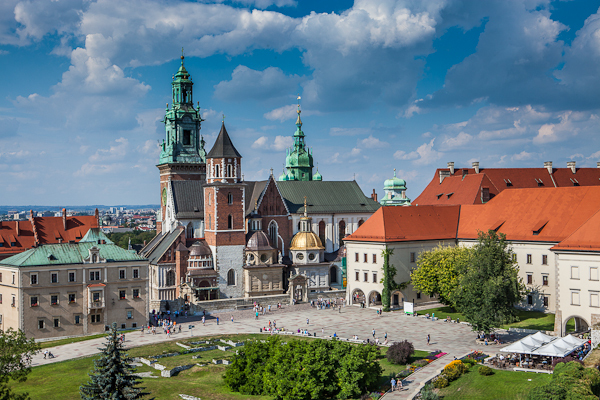 The same King that has rebuilt the Salt Mine (Kazimierz Wielki) has also created the city which is now the Jewish quarter of Kraków and was named by his name – Kazimierz. Nowadays the quarter seems to have stopped in time and is filled with Jewish restaurants, typical shops and the roofs of mosques gazing at us inbetween the beautiful tenement houses. Thanks to my Friends I have also got to know that there is a Jewish tradition to put little stones on the grave in order to make sure that the soul does not leave the body deceased. Another, more practical, explanation is to show others that someone has visited the grave recently. Not to be too long with the legends of Kraków, I would like to finish with recommending few places that we were lucky to visit. Super cozy and friendly place with very cute breakfasts and lunches. Additional advantage is extremely friendly dog of the owner and again… being hidden in-between the buildings! Zapiekanka on Plac Nowy – https://www.tripadvisor.com/Restaurant_Review-g274772-d3700898-Reviews-Endzior_Zapiekanki-Krakow_Lesser_Poland_Province_Southern_Poland.html Foreigners call it a Polish pizza – for me it is more like a bruschetta thing. In any case, everyone loves it! Typical polish street food. My personal recommendation – the simpler the better (ham, mushrooms and cheese with ketchup obligatory). Because you simply can’t leave Kraków/Poland without trying few different flavours of vodka. It would have been as if being in Italy and not trying pasta! Another place you can’t miss is the Milk Bar – the best pierogi, the best dumplings, the best bigos and the best krokiety – after my Grandma’s, my Mum’s and mine 😛 The only issue was very rude staff, but you can handle it for the taste of their food. I really hope that I have made you want to discover Poland a bit more and in case you need local’s advice, let me know as I have much more tips and ideas for this trip than I could have shared here! Hope to hear your stories on this city soon!